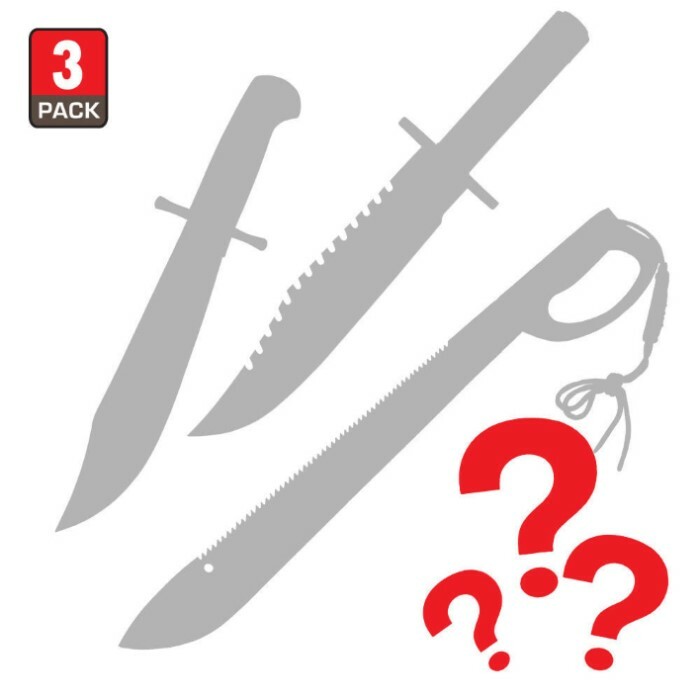 We've got another great savings opportunity for you with this Bowie Knives and Machetes Mystery Bag! For less than $30, you'll receive a combination of knives in this mystery bag. These products are brand-new, never-opened and we are selling them at this unbelievable discount rate because we no longer have enough of the individual products to maintain a location in our warehouse. So we mixed them altogether in a giant box and we just pull random items from the box until it's all gone. We will continually restock these with different products as our inventory levels change. We're excited about passing along this opportunity for incredible savings to you. The value of this bag is GUARANTEED to be more than what you pay. It'll be just like opening a present when your mystery bag arrives! This is a great deal, very impressed with this purchase, and all the other items I have purchased. From ordering to receiveing the order was a great experience and delivery was prompt. This deal is pretty solid, 3 knives for $30 bucks, ain't really a better deal out there, except I got three of the exact same tactical Bowie knife, all three are in good condition and decently sharp. It was just slightly disappointing to open the box and find a bunch of the same thing. May buy again, may not. I guess I had $30 burning a hole in my pocket so I bought this mystery deal bowie knife / machete box. 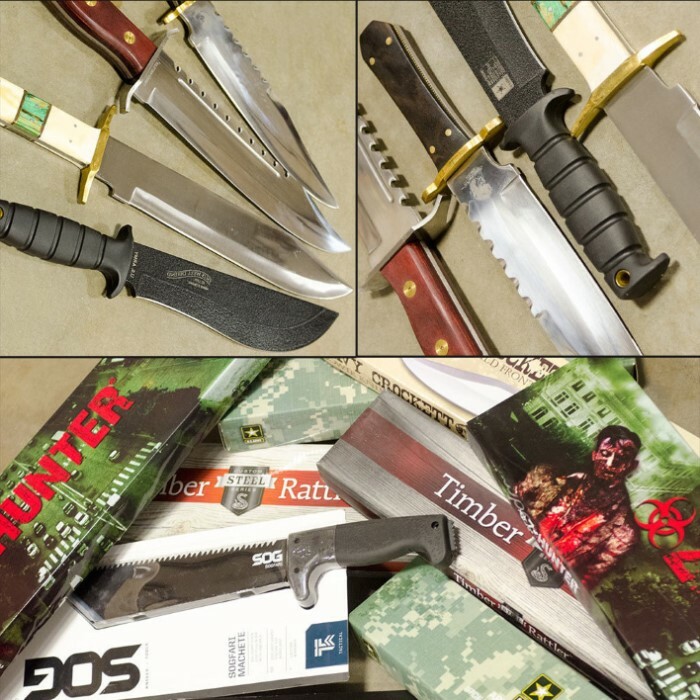 I received a $14 NRA tactial survival knife (which is a great survival knife), a $15 black legion death rider (neat looking but, no real practical use), and a $20 Colombian sawback machete (the only machete / bowie knife in the box). Over all it was good deal (some what misleading) and for $30 my expectations were not high. I am pleased with the purchase but, it could be debated that 2 of the 3 items might not fit the definition of a bowie knife or a machete. 4 out of 5 stars. Not a bad deal, it was fair. I got a united cutlery columbian machete, a weird unusable black legion fantasy spear-machete thing and a usmc tacticool tanto-combat style knife. Not my thing but a grab bag is a gamble. I took another chance, I did I mystery deal one other time, wasn't happy but BudK took care of that, but this Bowie & machete deal was great, thanks again guys!!!!! I was very pleased to have received two large Bowie knives and a kukri style machete. Well worth the money. My only issue was a few cracks running through the handle of one Bowie knife. Thanks! This was my first order from BudK and I will definitely order this item again and again. The knives I received were excellent. I sold two of the three pieces to co-workers as soon as they saw them, one sold for more than the cost of the original deal!!!. Thanks for the great products and service. Ordered this and received 3 of the exact same timber rattler Bowie knives. Nice knives but, a little bit of variety would have been nice. I have ordered many of the mystery deals on here before and always been pleased with them. I understand duplicates can happen but three of the same knife cmon.